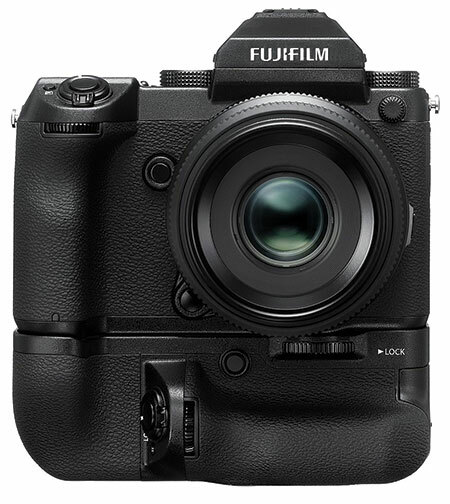 Valhalla, NY—Fujifilm North America Corporation announced that the Fujifilm GFX 50S mirrorless medium-format digital camera will launch late February 2017. 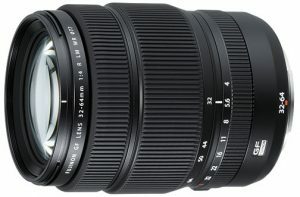 It will be released with an initial selection of three Fujinon lenses: the GF63mm f/2.8 R WR; GF32–64mm f/4 R LM WR; and GF120mm f/4 R LM OIS WR Macro. 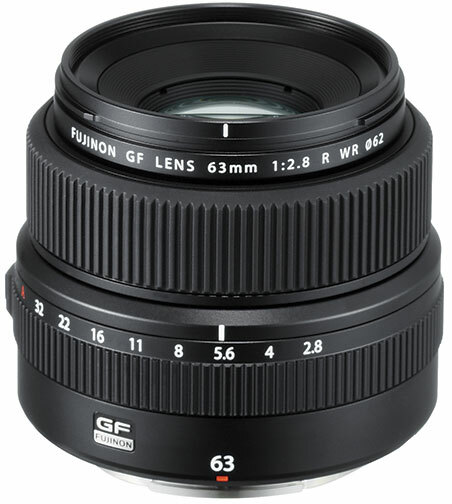 As part of the GFX system, the Fujinon GF lenses leverage the mirrorless system’s structure. The G mount has a short flange back distance of 26.7mm that reduces the back focus distance as much as possible. This is said to prevent vignetting and achieve edge-to-edge sharpness. All GF lenses have been designed to support sensors of more than 100 megapixels. Furthermore, GF lens barrels have an aperture ring similar to the one on Fujinon XF lenses, for intuitive operation. A C (command) position was added to the aperture ring to enable users to change the aperture with the camera’s command dial. The A (auto) position and C position feature a locking button installed on the aperture ring that must be disabled to implement changes. The sensor is engineered to capture textures and subtlety of tone that are unique to large-size sensors. The texture and tone combine to give a three-dimensional effect. For flash photography in the studio or outdoors during the day, the GFX 50S sensor has a native ISO of 100. It can also be adapted to various aspect ratios, including 4:3, 3:2, 16:9, 1:1, 65:24, 5:4 and 7:6. The mirrorless medium-format GFX 50S also uses the X Processor Pro, the same processing engine used in the X-Pro2 and X-T2 cameras. 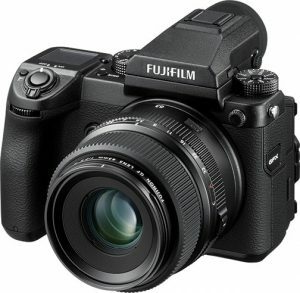 This allows photographers to use Fujifilm’s proprietary film simulation effects with a medium-format sensor. In addition, the camera supports Full HD video recording at 29.97p/25p/24p/23.98p. It also introduces a color chrome effect that reproduces subtle tones in highly saturated subjects. Also notable are the camera’s 3.69M-dot, organic EL electronic viewfinder (EVF) and 2.36M-dot touch-screen LCD back panel. The EVF is detachable to allow for flexible operation. Users can attach the optional EVF-TL1 EVF tilt adapter accessory to permit the finder to be tilted to 90° vertically and swung ±45°. Furthermore, the 3.2-inch, 2.36M-dot rear monitor offers touch operation for the menu, focusing points and image playback. The 3D, tilting LCD screen is designed to improve operability and make viewing images and checking focus easier. The camera is also equipped with a 1.28-inch LCD sub monitor on the top of the body. Exposure data, such as aperture and shutter speed, are displayed on this screen. Additionally, like the flagship X-series models, the GFX 50S features dedicated dials to independently set aperture, shutter speed and ISO. Aperture and ISO feature a C (command) and the shutter speed dial has a T (time) position. 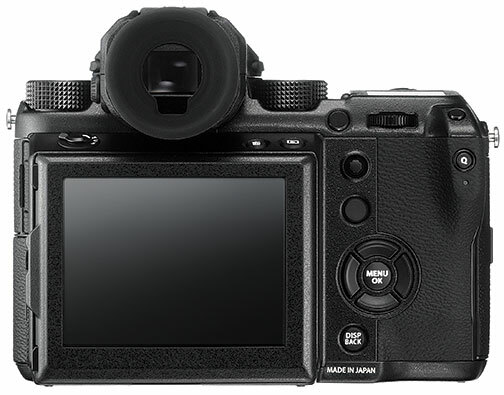 Setting the dial to this position lets users change exposure settings via the command dials on the front and rear of the camera, according to preference. Furthermore, the camera employs a 117-point (9×13/maximum of 425 points when miniaturized) contrast autofocus system. 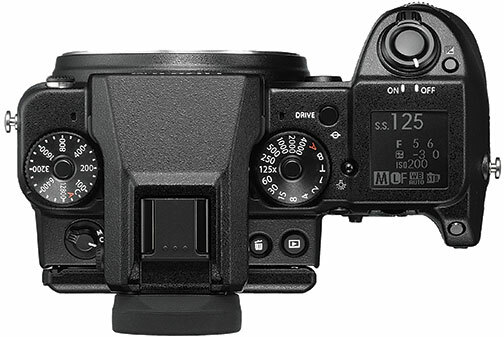 According to Fujifilm, “High-precision AF on the imaging sensor dramatically improves focusing accuracy with the shallow depth of field produced by medium-format lenses.” And focus point selection can be performed using the focus lever. Alternatively, users can select the focus point from the touch-screen LCD. The Fujifilm GFX- 50S has a 1.28-inch LCD sub monitor on the top panel. 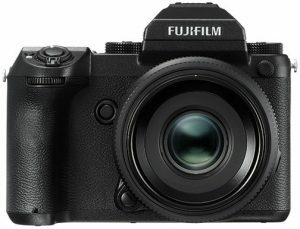 Constructed from magnesium alloy, the Fujifilm GFX 50S weighs approximately 43 ounces when paired with the Fujinon GF63mm f/2.8 R WR lens. As a result, it weighs approximately 60% of a medium-format DSLR camera equipped with a sensor of the same size. When compared to a full frame, the weight is almost identical. Overall camera body height and width were also minimized to overturn the perceptions regarding the mobility of medium-format digital cameras. In addition, the GFX boasts dust and weather resistance, and it can operate in temperatures as low as 14ºF. It also features dual SD memory card slots. The Fujifilm GFX 50S mirrorless medium-format camera body will ship late February with a suggested retail price of $6,499.95. The mirrorless medium-format camera will reach retail with the following three lens options: the GF63mm f/2.8 R WR (50mm equivalent in 35mm format); GF32–64mm f/4 R LM WR (25–51mm equivalent); and GF120mm f/4 Macro R LM OIS WR (95mm equivalent). All Fujinon GF lenses are dust and weather resistant. They are also built to withstand operation at temperatures as low as 14ºF. In addition, fluorine coating applied to their front lens elements creates a hydrophobic coating that repels moisture. With 8 groups and 10 elements, including 1 ED (extra-low dispersion) element, its lens construction is the most suitable for high-resolution. 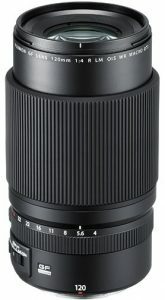 The small, lightweight lens has a diameter of 84x71mm with a weight of 14.2 ounces. Aberrations due to focus distance are said to be suppressed, as the lens uses the front group for focus. It will retail for $1,499.95. This lens is constructed of 11 groups and 14 elements, including three aspheric elements, one ED lens and one super ED lens. 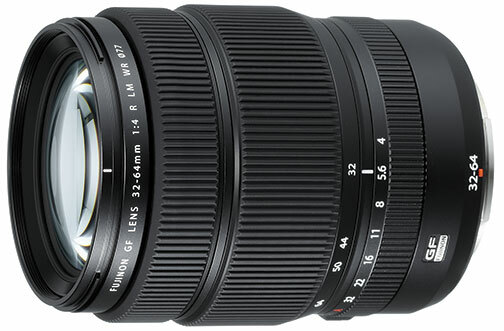 Fujifilm says this allows the lens to achieve image quality rivaling prime lenses. In addition, it uses internal focusing, thereby reducing the weight of the lens. It also achieves fast, silent AF by using a linear motor to drive focus. SRP: $2,299.95. This weatherproof lens is constructed of 9 groups and 14 elements, including three ED elements. By adopting a floating focus method using a linear motor, silent high-speed autofocusing is achieved. Furthermore, due to the arrangement of the ED lenses, chromatic aberrations are also corrected, contributing to high-quality images. When designing this lens, Fujinon engineers considered the quality of the out-of-focus area, both in front and behind the plane of focus. As a result, the lens produces artistic bokeh. 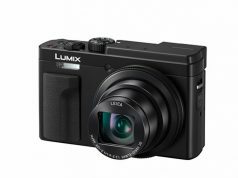 It is also equipped with optical image stabilization (OIS) effective up to five stops. This makes the lens suitable for handheld shooting or shooting in low light. SRP: $2,699.95. 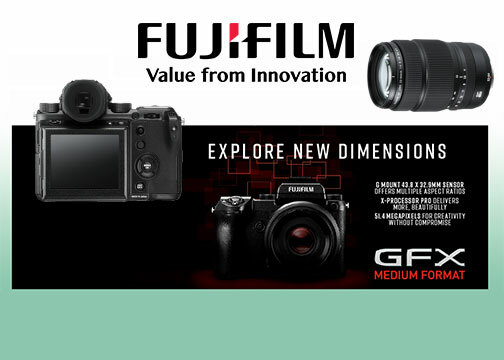 Fujifilm announced that three additional Fujinon GF lenses would be introduced later in 2017. 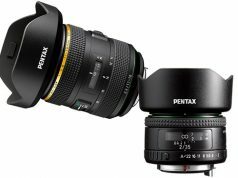 They will be the: GF110mm f/2 R LM WR (87mm); the GF23mm f/4 R LM WR (18mm equivalent); and the GF45mm f/2.8 R WR (35mm equivalent). 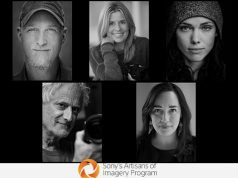 The company additionally announced that several optional accessories, which will be sold separately, would be available for the mirrorless medium-format GFX 50S. Vertical Battery Grip VG-GFX1. Designed to place the release button, dials and function buttons in the same positions when shooting vertically, the battery grip can be loaded with one NP-T125 battery. This will lower the frequency that batteries need replacing. Also, by connecting the AC-15V accessory (sold separately), it is possible to charge the battery within the grip in approximately two hours. When mounting this accessory between the camera body and the EVF, the angle of the EVF can be changed from 0°〜90° vertically and from -45°〜+45° horizontally. This allows users to shoot at various angles while using the viewfinder.